Here’s something to look forward to … or not! If you’ve been keeping track of intense downpour events for the past 50 years as NOAA has, you’ve noticed that they are more frequent in Pittsburgh than they used to be. This will only get worse. 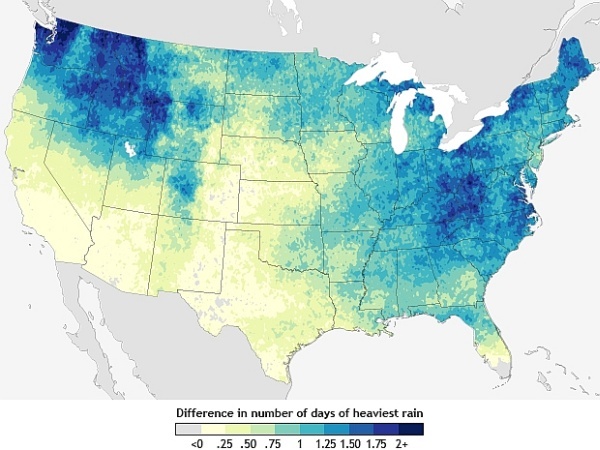 According to NOAA’s National Climate Assessment, by mid-century the frequency and intensity of heavy rain events will increase dramatically in some parts of the country, especially in Washington, Idaho and western Montana. The bluest locations on the map will experience two or more additional days per year of record rainfall. Pittsburgh is not exempt. We’ll see an increase in downpours and there will be an even higher frequency north and south of us. Watch out, Cleveland and West Virginia! For Allegheny County this map is particularly scary because of our old combined sewer infrastructure (sewage + storm water) that overflows into the rivers after as little as 1/10″ of rainfall. If you visit our rivers you’ve seen the toilet paper. The situation is so bad that Allegheny County is under a 2007 EPA consent decree to fix it. We are not the only city with this problem! Obviously, the time to fix our sewers is now and the solution has to handle more rain that we get today. Click here to read more about downpours on NOAA’s website and here for information on Allegheny County’s wet weather problem. Just because I feel that someone should be the voice of climate change dissent, I will say this. If climate forecasters can’t even accurately predict the strength of the hurricane seasons for the next year or two, how can they say with conviction “the frequency and intensity of heavy rain events will increase dramatically in certain parts of the country”? For the past three years, they’ve been telling us that we will have X number of strong, possibly disastrous hurricanes each year, and we haven’t had any. We’ve had particularly quiet hurricane seasons those years. I would imagine that the frequency of heavy rains increases dramatically somewhere every so many years. Weather is not constant. I would like to know what the climate change supporters would consider normal. I would really like them to tell me that. So, if we have a mild winter, they all scream Global Warming!, but if we have a cold winter, like this year, they scream Polar Vortex moving south because of Global Warming elsewhere!. What is normal? Most of western PA is 6a on the hardiness map, which is an average extreme low of -10 to -5 degrees F. How are we going to get that cold if the Polar Vortex doesn’t drop down into our area? This is not an even temperature planet….the climate in any particular region changes all the time. I would love to live long enough to see the climate change people proven wrong, but sadly that won’t happen since the planets’ life cycles are way longer than our own. Mary Ann, there is a difference between short range (a day, a week, a season) & climate forecasts. Short range are harder. 7 day forecasts in Pittsburgh are particularly impossible. “Will it rain on my wedding?” Who knows! “Will my grandchildren live on an Earth that is overall warmer?” You betcha! I am glad I won’t live long enough to experience the worst of climate change. It’s not going to be a pretty picture & the economic upheaval will be enormous.